Orthodontic Panorama of the third millennium showed few news if compared to the last century. Within the amazing new perspectives of our time, skeletal anchorage has undoubtedly a primary role so that researchers from all the world from at least ten years studied its potential applications. The orthodontic School of Ferrara started to study skeletal anchorage by means of the contribution of the mourning Dr. Aldo Carano who invented the M.A.S. miniscrews to stabilize anterior anchorage during the distalization phase with Distal Jet. The great advantages of this new method were immediately clear for all the international orthodontic community. 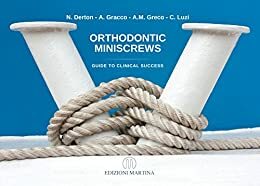 This multi hands textbook is written by all young orthodontists alumni of Ferrara Orthodontic School and now expert clinicians recognized all over the world. The textbook explores skeletal anchorage topic giving to the reader the possibility to deepen the theme both from a clinical point of view and from a biomechanical point of view. Ferrara School, from about ten years, focused on this topic through different researches identifying first the so called “safe-zones”, the most safe insertion sites for miniscrews, then through the understanding of screw components in order to guide orthodontists in the optimal choice and finally through the formulation of a new biomechanical system needed for a more modern orthodontic approach able to substitute old anchorage concepts. Today both beginners and experienced orthodontists need to face with skeletal anchorage because it can solve one of the oldest problem of the orthodontic discipline: patient’s compliance, offering to orthodontists predictable results reducing unwanted unsuccessful outcomes.